In the beginning of Tuchel’s tenure as head coach in Dortmund a special product developed on the field due to the interaction of the style of play from the previous coach and his own. The team was in a transition phase where they were moving from Jurgen Klopp who was known for his intense, compact, and dynamic style of play both in and out of possession, to former Mainz coach Thomas Tuchel. Tuchel’s immediate impact was that he brought a more positional style of play to BVB as he had further developed his view of the game in his 1 year break while famously having multiple discussions with Guardiola on the topic. The Spaniard is perhaps the most well-known advocate of the style of play in Europe’s top 5 leagues and this education helped Tuchel improve Dortmund’s possession game, which was a weak spot in previous years under Klopp. With Klopp’s influence still fresh on the players’ minds a powerful mix of the narrow, fast, and aggressive German style of play and the positional, controlled, and fluid Spanish style of play was created. I have chosen this match to analyze because it is perhaps the most impressive and dominant showing of this unique team. At their peak in this phase Tuchel’s Dortmund was one of the best teams I have ever seen. System during initial phase under Tuchel. Lineup against Odds is in parentheses. 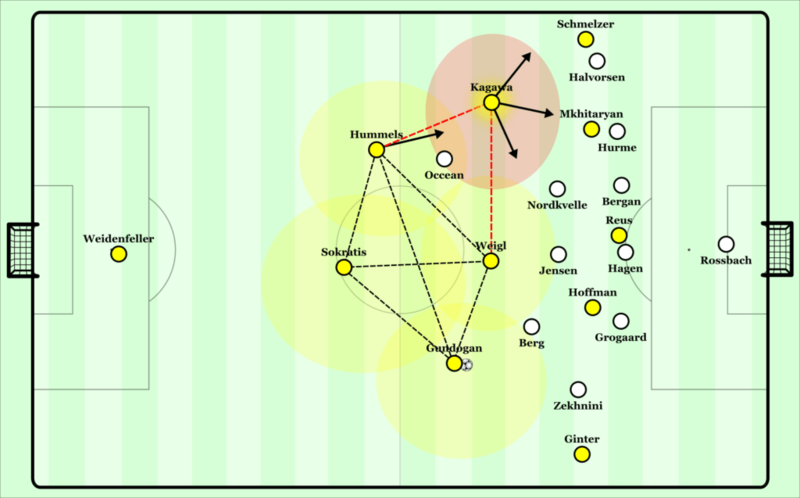 Immediately visible when Dortmund has the ball is the pre-determined distances between the players and the specific positions each one should occupy in the team. Gundogan as the right #6 dropped deeper and wider to the right of Sokratis while Hummels pushed higher and wider into the left halfspace. Weigl remained in the center in the role of a typical positional #6 such as Busquets or Guardiola while Kagawa positioned himself in the left offensive halfspace. Both fullbacks moved high and wider up the flanks while the wingers tucked into the center next to Reus. What originally began as a 4-2-3-1 on paper looked more like an asymmetrical 4-3-3 (like that of Xavi and Iniesta’s asymmetry under Guardiola) that could fluidly move into a back 3 as well as the two above mentioned formations. Weigl would at times drop between the central defenders if they lacked connection while Kagawa and Gundogan played as the two central midfielders in a 3-2-4-1. The players’ improved appreciation of connections in possession allowed them to move cleanly through different structures in this hybrid system without losing stability. Odds’ pressing scheme was interesting in their 4-1-4-1, their left #8 would press out to Ilkay and run through to Sokratis on a potential back pass while the #9 remained on the far side “halfback”. One of the two remaining central midfielders would push up to Weigl while the left winger attempted to stay between Ilkay and Ginter as the #8 ran to Sokratis. In theory, this allowed them to have direct access to Dortmund’s “buildup diamond” in every position to isolate the outfield player on the ball and potentially force a turnover through higher pressing. The Odds pressing scheme. Notice the possibility for Hoffman to dribble inside or combine with Ginter. On the far side there is an overload because Jensen struggles to cover the width of the field. BVB coped with this well by using low vertical passes into the wingers checking back towards the ball in the halfspaces. Normally this can be dangerous as the wingers would be followed tight by their marker who could more easily prepare to win the ball from behind on straight passes as opposed to diagonal passes. 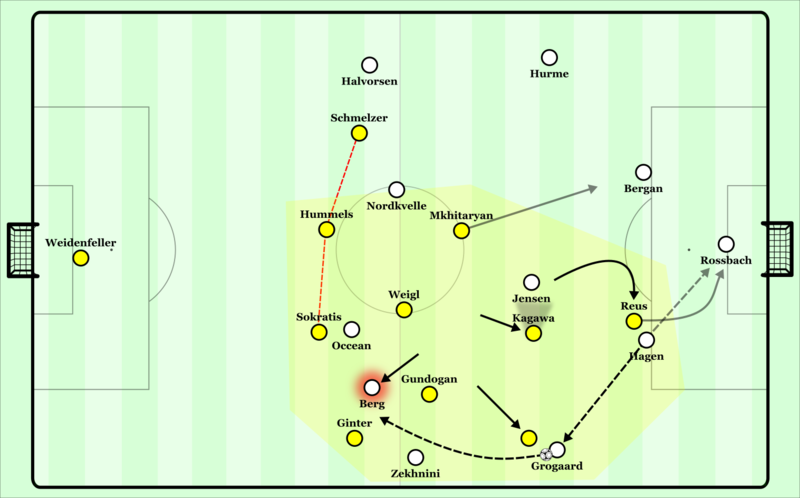 Due to the height of Dortmund’s fullbacks the opponents couldn’t follow the wingers as tightly due to the risk of a long pass being played over the defensive line into the free fullback. Mkhitaryan in particular did well to expose the hesitant movement of the opponent fullback by quickly dribbling in towards the central defenders and into the box. This is one method which allowed Dortmund to break pressure and switch the ball to the open player on the far side. The pressing scheme from Odds seemed to be designed originally for the 4-2-3-1/4-3-3. In theory, the #9 would mark Hummels while the left #8 pressed Sokratis and left Gundogan in his cover shadow. The right #8 would move up to Weigl while the #6 moved towards Ilkay or Kagawa depending on which side of the field the ball was on. The far side winger on the team would always move towards the center to cover Gundogan or Kagawa while leaving the far side fullback open, this way the team morphed into an asymmetrical 4-1-2-1-2 pressing structure. The pre-determined distances and positions to occupy the entire pitch in Dortmund’s structure had a clear benefit in combatting Odds’ pressing. Because Kagawa and Gundogan are spread out into their respective halfspaces it made it difficult for the opponent #6 to maintain access and isolate players in the first line of buildup from their forward passing options. The pressing could not shift as fast as the ball circulation could and therefore Dortmund broke through the opponent midfield on numerous occasions with vertical passes through the opponent midfield. If Odds’ #6 could shift across to press either Gundogan or Kagawa with proper timing, their dribbling ability often meant they were able to turn out of pressure and move towards the opposite side of the field with the ball and play out the overloads on the far side. The height of Odds’ press would move up to the BVB back line and stop once the ball was passed back to the goalkeeper instead of the player running through the back pass to the goalkeeper while the central defender remains in the cover shadow. Weidenfeller became a safe zone due to lack of pressure on him. He is able to play at his own rhythm and play long passes into overloads depending on which side Odds was pressing from. This forced a lot of the possession to move through Weidenfeller, which resulted in more long passes towards Odds’ backline. The long passes were aimed particularly well though as the goalkeeper could control his own rhythm of play and pick weak spots in the opponent press. The key aspect in this pressing scheme is that Dortmund wouldn’t be able to access the far side fullback while the winger tucked in on a BVB central midfielder. For example, when Weidenfeller received the ball from his right side without pressure he could quickly play over to the left wing where both Kagawa and Schmelzer are waiting while only Odds’ winger is there to compete. Mkhitaryan’s presence in the area created a favorable pocket to win second balls and break the passive high press. This also occurred on the opposite flank. Weidenfeller’s kicking range also played an important role as he could play long pass nearly to the opponent penalty box which forced the defensive line to drop further and created larger spaces between the opponent lines resulting in poor control of second balls. When Odds would send their striker to press Weidenfeller (normally not on the back pass but from the far side halfback with less momentum), the coordination from the central midfielders to prevent passes into the middle was poor. Gundogan or Weigl could check down towards the ball relatively freely and bounce the pass from Weidenfeller into the opened central defender which the striker had left. Odds’ far side winger was with a BVB central midfielder and fullback as I had mentioned above so he could not move higher to press the opened central defender due to the risk for a long pass into his position. BVB’s back 3 with the goalkeeper and 3 central midfielders is difficult to force into turnovers unless the press is done very well to isolate the player on the ball from such a large amount of pass options. Uncoordinated high pressing is exactly what resulted in Dortmund’s 3rd goal as they broke through Odds and made it to their box before passing back to Ilkay for a chip over the top to Mkhitaryan’s blind side run behind the opponent fullback and into the box to lay it off for a Reus tap in. Through the multiple methods mentioned above, Dortmund could consistently force Odds into a low block. In the low block, Odds’ wingers had to stay tighter to the fullbacks because quick overlaps can result in surprising overloads close to goal that lead to penetration in the penalty box and scoring chances. For this reason, BVB could create a passing rhythm deeper in the center of the field as Odds’ wingers began to fall back and be less involved in pressuring the buildup line. The high fullbacks force Odds to either put proper pressure on the buildup diamond or fall back to avoid overloads on the wing. Complete control of the center is taken by Dortmund and they penetrate the defense from this locus of control with their deep playmakers. 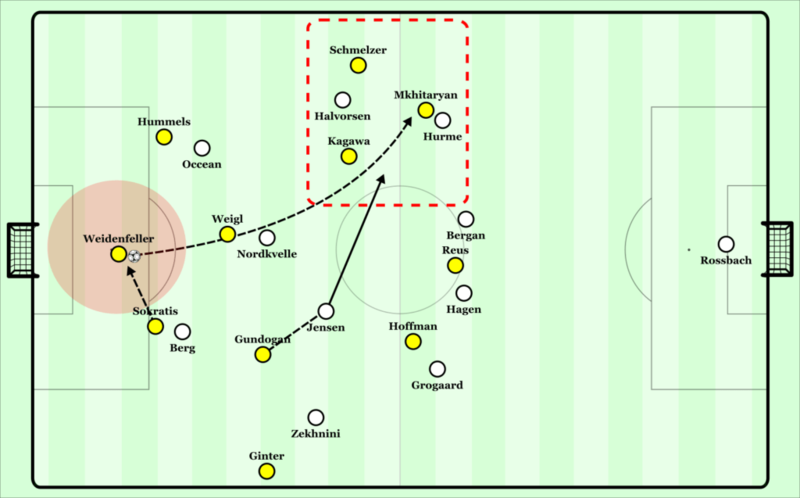 In situations where Odds’ wingers attempted to remain narrower and attached to the midfield line, Dortmund could find long diagonal passes to the overlapping fullbacks on the wing because of the lack of pressure on the playful buildup diamond from the #9 and the #8s. This is one clear benefit of Gundogan dropping to the side of the back line as he can add an extra player to the first line of play to overload opponent pressing while he is playmaking from the right halfspace and the less-skilled Sokratis can remain in the center to play more simple passes. Hummels, Weigl, and Gundogan formed a line of 3 playmakers that can play passes through or behind a low block, and if the opponent attempted to press them their dribbling ability allowed them to play passes over the wings to breakthrough. In this way, Dortmund was able break down low blocks, which are normally considered the most difficult form of defense to break down for teams with long periods of possession. Kagawa’s launch pad. He can freely overload multiple areas while Hummels moves up to form the diamond. Otherwise they maintain a stable 2-3 structure with an extra base control of defensive transitions through counterpressing. Kagawa, Weigl, and Gundogan are all at a high skill level in pressing. As a type of left #8 Kagawa could drop out of the opponent shape and toward the wide left position a fullback would normally occupy to form more of a 2-3 buildup base while there is a forward line of 5 with the fullbacks acting as wingers. 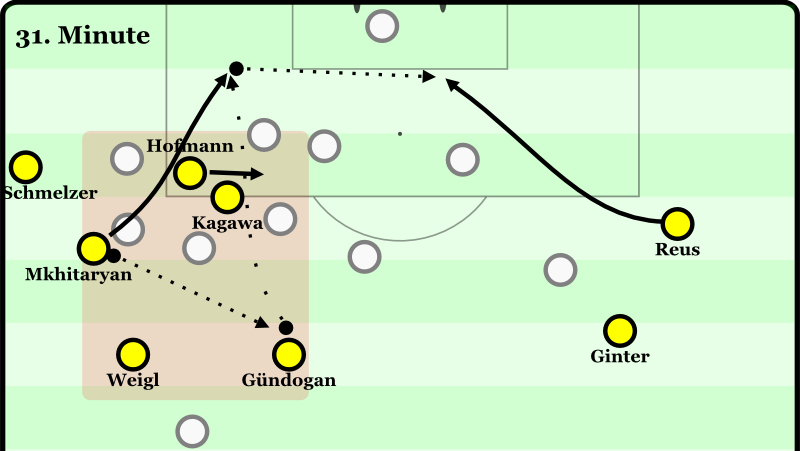 The movement meant that Kagawa moved outside of the range of access of the opponent central midfielder (if done during a switch of play, in which such movements are typically done) while the opponent winger follows the fullback and the opponent fullback follows the narrow Dortmund winger. This created a small overload on the wing and resulted in passes behind the defensive line to the BVB fullback for crosses into the box. The structure also meant that BVB was very well prepared for counterpressing situations as they covered the 2 halfspaces, the center, and had 2 defenders covering the depth. Odds had a particularly difficult time considering the offensive presence they had for counters in a low block 4-1-4-1. Because Dortmund operated in the buildup diamond I mentioned earlier, it allowed Kagawa the freedom to roam and overload the space between the lines or the defensive line. This is quite a fitting role for him and the initial deep positioning in the 2-3-4-1 provided a launch pad for him from which he can make runs at speed to the defensive line. Coming from a deeper zone with speed meant that opponent midfielders were less likely to track his runs and created dynamic and surprising overloads for BVB in between the lines. The Dortmund forwards could play lay-offs or dribble freely in front of the defensive line as the defenders reacted to Kagawa’s runs, while never being able to cope fully with the overload situations. Having a player with time and space in front of the defensive line with multiple runners behind the defense is a situation every coach dreams of. This would normally be considered an unstable movement to make from a structural perspective, but it fit quite well with Dortmund’s overall player characteristics. Hummels would move higher into the left halfspace to reform the buildup diamond as Kagawa moved higher. 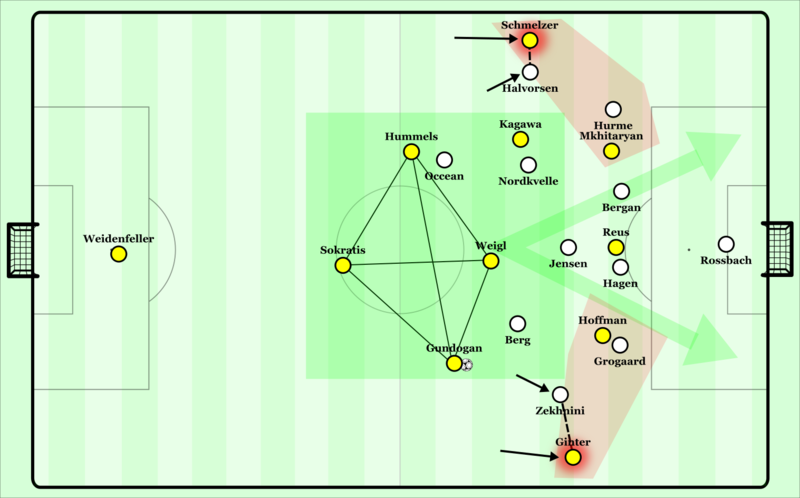 With the 3 playmakers in this diamond I mentioned earlier and Sokratis covering the spaces behind with his speed and anticipation, Dortmund not only had an effective offensive weapon but also still maintained a stable base structure for counterpressing and defending transitions. At times Kagawa could position himself more permanently between the lines of the opponent to create a more “static overload” in a collective structure which looked more like a 1-3-4-2. This of course provided the buildup diamond with a free player between lines if under pressure but it also provided freedom for the Dortmund wingers to drop down or outside toward the halfspaces whenever they felt it was necessary to create chances. They could do so without being tightly marked due to the large offensive presence on the defensive line. The fullback receives to his feet and Kagawa immediately runs with Reus through the defense to give options into depth but also clear space for Mkhitaryan. The Armenian drops off into the newly formed pocket and takes up the role of diagonal playmaker. The freedom Kagawa could provide to the wingers was the key in his synergy with Mkhitaryan on the left. Often if Schmelzer could not played behind the opponent press and received the ball to feet instead, it was a cue for Kagawa to run forward through the opponent defense to provide an option behind the defense and clear space for Mkhitaryan to drop into. Whenever penetration did not occur on the left wing Mkhitaryan liked to immediately drop out of the opponent shape to receive the ball and begin dribbling diagonally. This is in some ways like the relationship Rakitic has had with Messi in which the central midfielder clears space and occupies defenders to allow the winger to dribble inside and be a diagonal playmaker. Mkhitaryan certainly has the dribbling, passing, and finishing qualities to be dangerous from such positions. From there the Armenian can dribble diagonally towards the halfspace and center while using his right foot. This allows him to keep his body between an opponent and the ball as he comes in front the left. Using his dribbling and playmaking abilities in tight spaces he can eliminate multiple opponents with diagonal actions – his goal comes from such a situation where he shoots into the top far side corner. The positional rotation created some interesting combinations as well. When Reus would make a run from the center and into the halfspace to receive a pass from the fullback, Kagawa’s run into Mkhitaryan’s original central position allowed him to join Reus with some momentum while he was briefly unmarked due to him coming from a deeper position. This created some situations in which Reus and Kagawa could look for quick combinations between each other in the box for shots on goal. During crossing situations, the wide players of Dortmund did well to penetrate toward the byline to force the Odds defensive line to drop toward their goal and create space for cutback crosses in the middle of the box. Reus’ movement as the #9 was mainly to run toward the near post with speed to push the opponent line deeper while the far side winger would cut horizontally across the box behind Reus’ run to open himself up for a shot. The near side winger normally remained dropped off toward the top of the box for a short cutback pass. The far side fullback would run into the box as well to pick up and crosses which made it all the way through the box. Of course, due to the fluid nature of Dortmund’s players these responsibilities often alternated. Odds’ low block allowed them to deal with these situations well as their central midfielders were close enough to drop with the defensive line and protect the space in front of them. To create truly dangerous crossing situations Dortmund would have to penetrate with even more of a surprising change in rhythm and speed. Gundogan helps overload Dortmund’s favored left halfspace. He has the ability to play chipped diagonal passes to blind side runs of his forwards into the box. This is a crucial weapon in breaking down low blocks and results in a BVB goal as Reus immediately rushes the goalmouth upon the breakthrough. This was achieved mainly through the skills of Gundogan as a deep playmaker and rhythm-controller of BVB. He was very involved in every buildup from a position which suited him well. This is a result of the Odds #9 being told to man-mark Hummels, which resulted in Weigl, Sokratis, and Gundogan having most of the ball in front of the opponent midfield line. From the right halfspace he could play longer passes to the opposite wing or halfspace and even diagonal balls behind the defense. These passes were executed with a high degree of cleanliness and intelligence in decision-making. 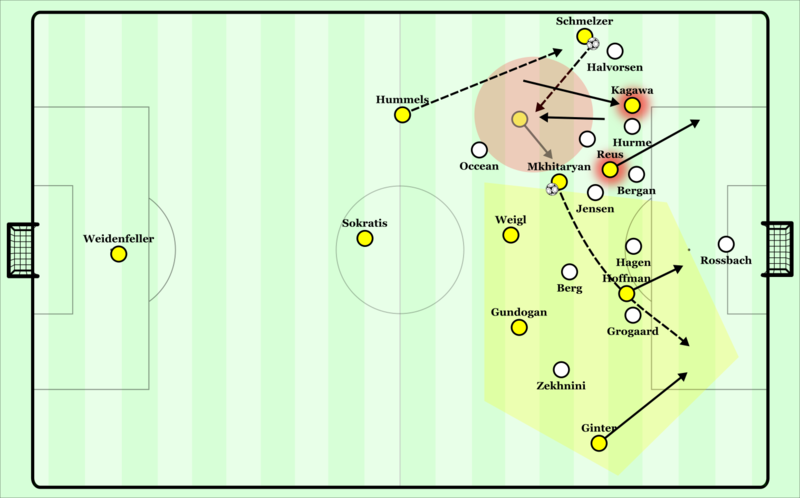 Instead of continuing with shorter passes which Odds’ could keep up with, Dortmund started to play more and more long passes to create space and time to break through the defense as Odds would have to shift a larger distance between each pass which makes it difficult to remain compact centrally. The increased speed in circulation and penetration meant that there were larger spaces between the Odds players during short crosses as they had to make larger collective shifts. It was especially difficult for them to keep the proper distances and positions between each other when a diagonal pass was played over the top of them as it is not as simple as reacting to a vertical pass by collapsing on it or shifting sideways for a horizontal pass. The increased space resulted in more clear shot chances inside the penalty box on cutbacks or balls across the goalmouth from the short crosses. Odds’ style in possession was typical for more direct teams. Their 3 forwards were high on the defensive line and wide, while the #8s also took up higher positions between the lines even when the buildup was under pressure. The central defenders remained much deeper than Dortmund’s line of initial pressing while the #6 and the two fullbacks were on a height in between these two blocks of the team. This resulted in very little central presence for Odds’ in buildup and in the end, it was simple for Dortmund to force long passes under pressure and control the second balls due to their compactness. Odds’ lack of presence in the center means Dortmund can press in a relaxed way. Notice Berg makes a run for a surprising overload, in these cases its necessary for the defensive line to shift further across to control potential danger. There is a complete control of second balls and a Klopp-style intensity in pressing. 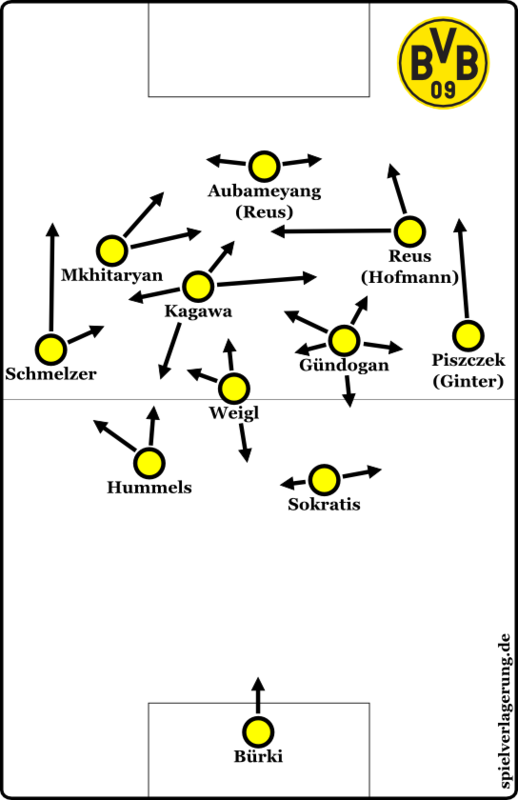 Odds were put into isolated pressure situations from a relatively passive press by Dortmund as they sent Reus and Kagawa to press the #6 and the central defenders while a winger would move out towards a fullback. There wasn’t much more presence required from BVB because the distances in the Odds structure were so large in between positions that extra support would not come into play often, which allowed the rest of the team to focus on winning the long passes and the second balls. If the ball was passed back to the goalkeeper Reus would run off of the “cover shadow line” of the central defender he was marking while the far side winger and fullback moved higher to support Reus in case the goalkeeper looked to play a short switch. This forced long passes with Odds’ structure more spread out than it initially was, which meant more difficulty in controlling second balls. 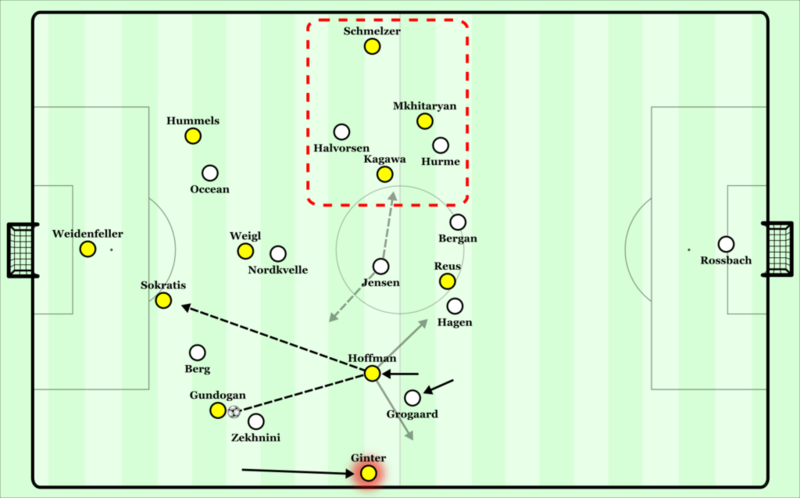 The Norwegian club most often looked to pass the ball wide into a fullback before hitting a long pass as it was the closest they could get to the Dortmund defensive line while pressure from BVB’s narrow wingers had not yet arrived fully. Dortmund’s defensive line had difficulty in shifting across the field towards the near side even while there was pressure on the opponent fullback. This resulted in Ginter and Sokratis having to cover runs into depth from the Odds #8, #9, and winger. Normally, if the defensive line would shift across further Sokratis could take the run of the #8 while Hummels comes across to take the #9 and Schmelzer provides cover on the far side because the far side Odds winger is inaccessible. Still Dortmund could cope with these attacks with relative ease due to the long passes being put under pressure by their winger. Due to their impressive possession game and counterpressing to stabilize it, Dortmund spent most of the match in possession of the ball and conceded few chances. Odds’ possession game was not up to a standard in which they could make significant progress or maintain possession of the ball for longer periods of time against Dortmund’s pressing. Both of their goals are a result of counterattacks. The first goal came from a second ball situation in which Dortmund had the advantage but the ball slipped past Gundogan for a break and eventual corner kick. The second came late in the game after the result was already determined after the goalkeeper could catch the ball and start a quick attack. Though Dortmund did not need to showcase their ability out of possession as much in this match, the signs of a Klopp team were still there. High intensity within their block, speed to press passes outside of their block, and compact positioning for second balls were all visible. The counterpressing to control defensive transitions was still at a high level and most of the goals Dortmund scored in the match were a result of balls won from counterpressing – the best playmaker in the world according to the now Anfield manager. This is not to say that Tuchel cannot coach these aspects into his team as well. His Mainz team was quite like what the public consider to be Klopp’s style of football. They were very compact, intense in their shifting and pressing both inside and outside of their defensive block, and transitioned with speed both offensively and defensively. Tuchel is a highly talented coach whom I as a coach and tactical-analyst myself admire. It appears that the focus in his time at Dortmund has been largely on the positional style of possession, and therefore over time the intensity and cleanliness in pressing faded from the defensive phases of their game. The team has evolved in a way which they make their defensive movements with intelligence but without real proactive pressure. At the same time the team has moved through a phase in which they favored more stability in defensive transition vs. dynamic buildup play through the center to create overloads and scoring chances. Because of the team’s evolution over time, the period in the very beginning in which Klopp’s priming was still fresh on the players while Tuchel made clear improvements to the possession game was truly special. They played in an impressive offensive style with very talented players and it will be interesting to see if the team can reach such heights once again. By AdinOsmanbasic in All Articles, Coach Analysis, Portraits, Team Analysis on May 20, 2017 .